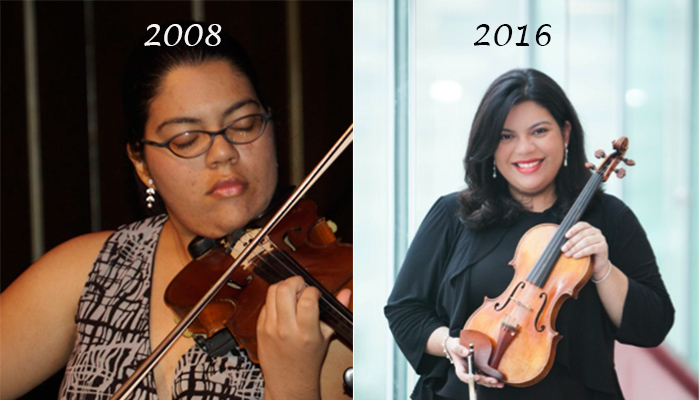 24-year-old violinist Karen Cueva appeared on NPR’s From the Top with Host Christopher O’Riley Show 187, recorded in October 2008, at age 17. In conjunction with her performance on the show, she also received From the Top’s Jack Kent Cooke Young Artist Award. Karen considers herself to be both a violinist and an educator who is passionate about issues of equity and representation in classical music. A graduate of The Juilliard School, Karen earned her Bachelor and Master of Music degrees in Violin Performance under the tutelage of Professor Lewis Kaplan. She is currently a Master of Education Degree candidate in the Arts in Education program at Harvard University Graduate School of Education. Karen is the co-founder of the Du Bois Orchestra at Harvard, a chamber orchestra devoted to social inclusion and educational outreach. “I was a senior in high school when I received the Jack Kent Cooke Young Artist Award and performed on From the Top. I combined the scholarship with another one I fortunately received, and bought my violin. Just two and a half weeks later I used it for my Juilliard audition. It enabled me to create a great sound, and I still play it to this day. Starting on May 9, 2016, Karen will use her outreach experience in a week-long residency in Miami with fellow From the Top alumni, working with more than 240 local students to celebrate the music of their community. Check back next week for updates direct from Miami!